There are indications that Nigeria's biggest airline, Air Peace may begin direct flights to India from Lagos. In the principle of reciprocity two airlines may be designated, each from one country and the two under the commercial agreement would endorse the number of frequencies the airlines would operate to one another's country. The High Commissioner said, "We had the bilateral air services agreement that was signed in January, we already have the approvals accorded to Air Peace by the government of Nigeria and the approvals by the government of India are currently in the process and we hope we can start direct flights sooner than later. "We have the approval that has been accorded to Air Peace for two flights to Mumbai every week and we hope to move forward on this front hopefully in 2019 itself. This is one of the targets we are working towards and subject to all necessary approvals, we should be able to move forward on this front." "We are open to any kind of arrangement; we will be open to all possibilities," he said. "I would say we are already late, direct flights are overdue. India is the second largest country in the world and Nigeria is the largest economy and largest country in Africa. There is no reason why our people should not be traveling, meeting more frequently," the envoy said. India is said to be one of Nigeria's largest trading partners, with bilateral trade between both countries at nearly $12 billion and Indian companies investing in projects worth $10 billion. 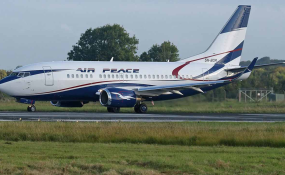 THISDAY learnt that Air Peace is ready for the direct flight to India, noting that as businesses increase between the two countries there is the need for a direct flight, which would benefit both nations in various ways.